Since leaving the army with a medical discharge for loss of hearing, I’ve hunted for headphones that I could wear without putting in my ears, so not to damage my hearing any further. Headphones to put in my ears were a no go, hook around the ear headphones still sat in the ear and so I was left with no ability to listen to my music. That was until I came across the Sennheiser Adidas PMX 680 Headphones, yes they are designed to fit into the ears just like every other set of headphones and worn like this they really are the most comfortable headphones to wear during working out and running. All other headphones I’ve trialled have never been suitable for running as they just always dislodged or even fell out of my ears. The Sennheiser 680 wraps around the back of the head and sits in the ears; an ergonomic designed neck band fits snug and secure, even during sprint training the headphones sat perfect in position. The cable runs through and out of only one ear piece giving more freedom without feeling tangled like some dual cable headphones sometimes feels like. The sound quality is awesome with a volume control on the cable to adjust volume without having to get your ipod/mp3 player out of a pocket or arm pouch. The cable also splits to make a shorter cable which is especially great when wearing an Armpocket, leaving no hanging cable bouncing around which can be annoying out on a long run. For a runner like myself who has a hearing problem which stops me from being able to put headphones directly into my ears, the ergonomic wrap around the back of the head design is perfectly snug enough to wear when out running having the ear pieces sat behind my ears without moving or falling off. 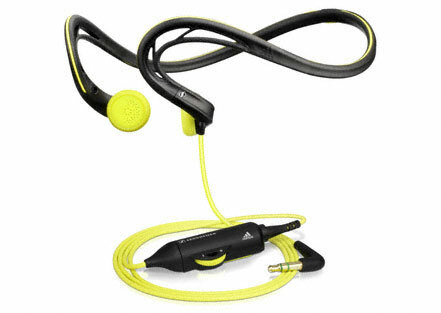 It seems that Sennheiser & Adidas have thought of everything to come up with the best headphones to the active person on the market, in my opinion, they are unbeatable. Some genuinely nice and useful information on this site, likewise I think the design has fantastic features. My brother suggested I may like this blog. He used to be entirely right. This publish truly made my day. You can not imagine just how so much time I had spent for this information! Thanks!